The architects propose to install photovoltaic and thermal panels, in addition to its self-washing roof which circulates solar-heated water to keep the building warm. The complex’s most prominent feature is the sprawling garden. Three existing trees, representing the holy trinity, will be joined by a series of birch, spruce, maple, lime, and ash trees to create a tranquil green space that can be enjoyed by both the public and churchgoers. This will also be connected to a green roof on the cultural center via a series of cascading terraces. All of the water used to irrigate the garden will be harvested in cisterns. In addition to creating continuity between the Church and Cultural Center, the swooping glass canopy diffuses sunlight. And a special glaze used on the Church’s golden domes lets in plenty of natural lighting. Perhaps the most interesting component of the design is its self-washing roof. A thin veneer of water will circulate on the roof, where it will be heated by the sun. As it is directed to underground reservoirs, it will keep the buildings warm and reduce energy consumption. Photovoltaic panels may also be built. 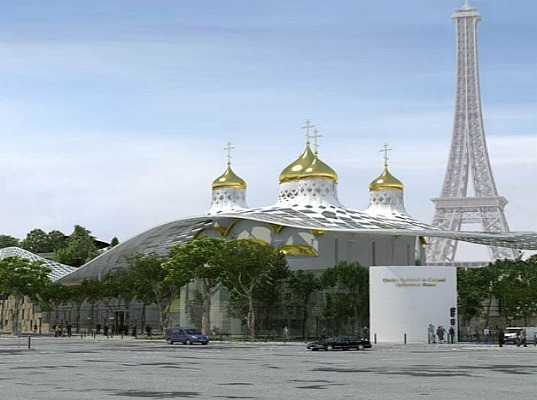 Despite importing some of the limestone from Russia in keeping with Russian Orthodox tradition, the designers will also recycle materials from the existing facade. And, finally, digging will be limited to protect the nearby River Seine. Russian architects Arch-Group and the French studio Sade Sarl have meshed old and new with this stunning 14th-16th century style Russian Orthodox church and cultural center. Commissioned by the Russian government for a corner property near the Eiffel tower, the complex showcases a transparent wrap-around glass canopy and a massive public garden. Although we're not too keen on the fact that some of the building materials will be imported from Russia, the building makes up for it with features like a green roof, potential alternative energy sources, harvested rainwater, and solar heated water. 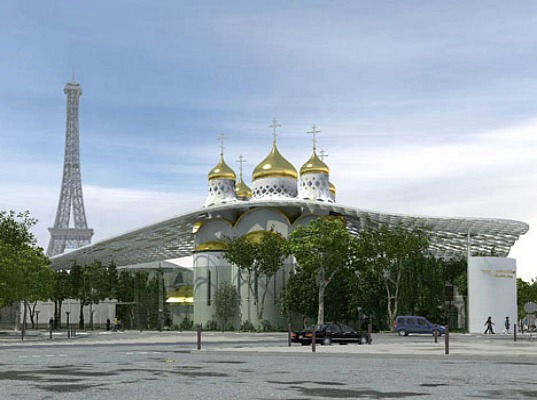 Slated for construction close to the Eiffel Tower, the new Russian Orthodox Church and Cultural Center had to be very respectful of the cultural and environmental context in which it will be built. The massive garden is the complex's most prominent feature that will be available to the public and churgoers. The swooping glass canopy diffuses sunlight. The garden will be connected to the green roof by a series of cascading green terraces. While some of the limestone will be imported from Russia in keeping with tradition, the designers will also recycle materials from the existing facade.